> Does the market really need a new ‘Good for Development’ label? "Through SMS we rate our produce every morning ... We have learnt how to farm: good farming with good prices... Before, the prices were a throw away price. We improved about 70%." Information and Communication Technologies (ICT) have a great potential for promoting rural development and reducing poverty. Through ICT, rural populations can gain access to important information, as well as new markets and income opportunities. In addition, ICT give poor populations an opportunity to voice their concerns. This potential, however, is by no means fully tapped yet. ICT infrastructure has seen strong growth also in Africa over the past years – most markedly in mobile telephony. Nevertheless, access to ICT in Africa is still highly inadequate when compared with countries in Europe. Moreover, access to ICT varies widely both between and within African countries. Outside urban centres, and particularly among the rural poor, ICT often remain something unknown. Numerous projects have already made ICT accessible to poor rural populations in practice. One way of doing so is by establishing telecentres. In his report, Ian Howard analyses two telecentres in Tanzania that have two very different histories. One of them owes its little-over-10-year-old existence largely to the initiative of a local autodidact, who built up the telecentre’s ICT infrastructure step by step based on cross-subsidies from other activities and on donations. The technical equipment is not the most recent, but there is sufficient local know-how to ensure its maintenance. In the second case, external donors cooperated with local authorities to build a large and modern telecentre with an e-training laboratory, an Internet café, and a radio station. The initiators took care to include all actors in planning activities from the very start. Today, chances are good that the local government will provide the necessary financial support once the project ends. The analysis under review demonstrates that the goal can be reached in different ways. However, it also points to the difficulty of running telecentres on a self-supporting basis. Nevertheless, their value for local communities goes uncontested: lower transaction costs and improved education and training opportunities are only two of many keywords in this respect. Applications of mobile telephony are likely to gain in importance at a particularly high rate in the immediate future. For poor rural populations, in particular, they offer numerous interesting possibilities, such as accessing weather and market data, getting advice on health issues, and transferring money. A new invention from India will even make it possible in future to set up and access so-called “VoiceSites”. Especially for illiterate people this “audio Internet” will provide a valuable opportunity to access information and broadcast their own contents to a broad public. 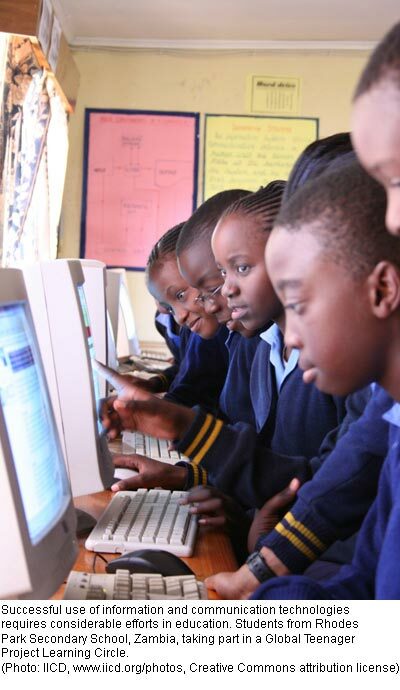 > ICT in Africa: Boosting Economic Growth and Poverty Reduction. Document prepared for the 10th Meeting of the Africa Partnership Forum in Tokyo on 7–8 April 2008. Gerster Consulting. 31 p.
Carbon trading, payments for environmental services (PES) and certification are just some of the market-based approaches to biodiversity conservation. However, given the complexity and highly interactive nature of ecosystems, the decision to adopt a PES scheme at one location may, in practice, lead to conflict elsewhere. This is not only a source of concern for many indigenous populations but is also the subject of a new publication by the Global Forest Coalition. To illustrate the point, the authors cite an example from Paraguay, where the adoption of a law on the valuation and remuneration of environmental services in 2006 should have served to promote forest conservation and led to official recognition of the rights of indigenous peoples. The reality, however, was rather different – both indigenous communities and small farmers’ organisations were largely left out of the consultation process which preceded the entry into force of the legislation. In addition, these communities lacked the property rights, well-placed government contacts or the resources to carry out an environmental impact assessment which they were required by law to do before they could make any type of PES claim. Since the introduction of this law which also enjoyed the support of conservationists, disadvantaged populations who are an integral part of the ecosystem have been marginalised even further. There is a strong chance, though, that the new government, which came to power in mid-2008, will take action to resolve the situation. In order to contribute to achieving the millennium development goals, current production systems must fulfil three conditions: they must produce enough to feed a growing population, contribute to reducing rural poverty, and – last but not least – slow and even reverse the process of ecosystem degradation. 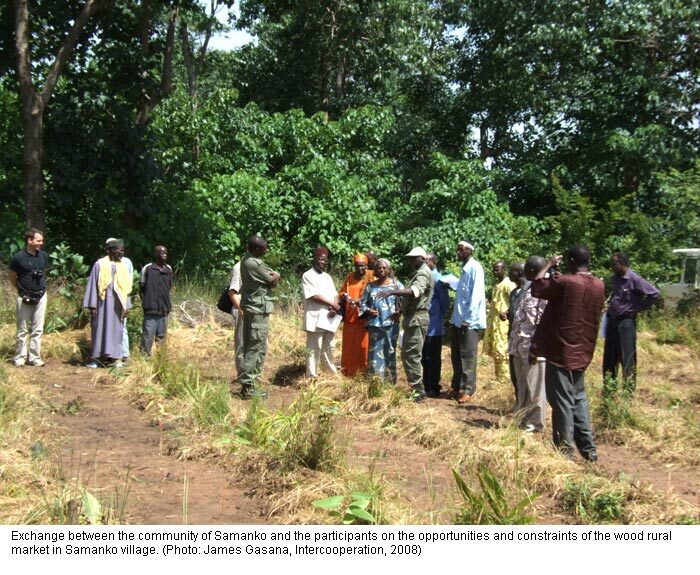 Sustainable land management (SLM) is considered an important approach to meeting these requirements. SLM is a process based on knowledge and experience that promotes the integration of land management, water management, biodiversity management and environmental management. However, the methods of SLM can be complex and difficult to implement, and their positive impacts are not always easily accommodated within the time horizon of a poor population. This makes it all the more important to point out and explain positive experiences. One example is an application of the “community watershed model” in Kothapally, India: research and development were driven by farmers’ groups at the watershed level, in cooperation with members of NGOs and the government. Cultivation of alternative crops, innovative pest management methods and other measures proved highly successful and were subsequently replicated in India, Thailand, Vietnam, and China. Does the market really need a new ‘Good for Development’ label? A recent study conducted by the Overseas Development Institute (ODI) on ethical labels states that most agricultural exports from developing countries can be considered good for development, as they generate income and employment in these countries. Yet, consumers often perceive the impact of trade as negative, because they worry about exploitation of poor producers. Recent growth in ethical trade indicates that consumers are keen to support development using their purchasing power. There are plenty of labels certifying environmental impacts, but not enough that certify development impacts. Goods with Fair Trade labels still represent only a small share of produce. As a study result, ODI suggests a new ‘Good for Development’ label which could make consumers aware of positive development impacts resulting from the purchase of most conventional developing country produce. The new label would cover many more products than existing labelling schemes do, and would include more producers from the poorest countries, which are currently underrepresented. The authors argue that such a label might generate a substantial increase in purchases of developing country products, thus helping to promote economic development among poor producers. Despite these benefits the proposed label is expected to have, the future will have to show how such a label can actually be implemented. Is there a guarantee that it will have a positive impact on development? How will impact monitoring be managed? And how will the new label take account of the need for environmental sustainability? These and other questions will have to be addressed. Around 20% of the world’s population use 80% of the resources. At the same time, an increasing number of people are consuming more than is necessary to cover their basic needs. Through the Marrakech Process, the world community is seeking to increase the sustainability of resource use and associated production patterns. Despite many innovative efforts, for example in eco-efficient production, recycling, and waste management, this endeavour frequently remains fragmentary. A large-scale breakthrough can only be reached on the basis of coherent national programmes that promote sustainable consumption and production patterns and are concerted with national development and poverty reduction strategies. To date, only 30 countries have established such a programme – among them Ethiopia, Senegal, the United Kingdom, and Finland. In the present guidelines, UNEP describes a process through which states can develop a coherent strategy. This process is divided into ten steps, reaching from planning to development, implementation, and monitoring. It is recommended that programmes be developed on a participatory basis, and that they be clearly targeted. Experiences from ten country studies show that the greatest challenges lie in the implementation of programmes, rather than in their development. Educational and awareness-raising campaigns are necessary, but not sufficient: tax, pricing and subsidising policies must also support the aim of achieving sustainable consumption and production. The 14th Conference of the Parties of the UNFCCC – COP 14 in short – took place in Poznan, Poland, in December 2008. What is the importance of these discussions to development cooperation? The main issues at stake are the future eligibility of mitigation options in agriculture, forestry and other land uses (AFOLU), options for technology transfer, and mechanisms for promoting adaptation and disaster risk reduction in developing countries. The AFOLU sector accounts for 30% of net greenhouse gas emissions worldwide. Over 60% of these emissions originate in developing countries. With regard to AFOLU mitigation options, much attention was given to reducing emissions from deforestation and forest degradation (REDD) and to the use of biofuels. The discussion focused on methodological issues, baseline definition, monitoring of emission reduction, and ensuring participation of indigenous and local populations. Less attention was given to the simplification of forestry projects in the Clean Development Mechanism (CDM). Other mitigation options in agriculture, including livestock management, soil management, carbon enhancement and emission reduction, were not discussed at all. Parties agreed to design a new climate regime to be launched during COP 15, 2009, in Copenhagen, Denmark. It is of key importance that development priorities are included consistently in this regime. The Tigray project was initiated 12 years ago in northern Ethiopia. The goal was to rehabilitate ecosystems and thereby sustainably increase agricultural production and create more stable livelihoods for smallholder farmers. Active participation and cooperation by farmers, researchers, experts and local extensionists made the project highly successful, stimulating the government to launch similar activities in other regions. Sustainability in the Tigray project was guaranteed by an integrative view of the landscape. Biodiversity conservation, diversification of crops and cultivation methods, as well as the use of locally available inputs such as compost were key elements of the approach taken. Participants developed innovative water management methods that contributed to soil improvement. Social aspects were not neglected, either: measures adapted to local customs, along with training opportunities, helped women to reap greater benefits from their fields and to tap alternative sources of income. This publication conveys a great amount of interesting information regarding the various components of the project. However, the reader will hardly find information about difficulties or problems that would need to be considered when replicating the project. Agricultural expansion, particularly the boom in soy and oil palm cultivation, currently poses a greater threat to the preservation of tropical forests than the logging industry. In addition, this new wave of deforestation and the resulting carbon emissions contribute to the unforeseeable consequences of climate change. This WWF leaflet uses graphs, photos, maps, articles and personal accounts to provide recommendations on how we, the consumer, can make more responsible choices. An example from Paraguay shows that the 2004 moratorium on forest conversion has curbed deforestation, without hindering the increase of soy production. To protect forests, alternative economic mechanisms like payments for environmental services (PES) compensate local landowners who produce observing defined environmental principles and penalise those responsible for felling the trees. Nevertheless, as the article “When conservation means marginalisation” also shows, the reality on the ground tends to be more complex and often scant attention is given to the fact that some conservation efforts may in fact negatively affect the livelihoods of certain populations. The workshop “Ownership and access rights in decentralised natural resources management in the Sahel” (Bamako, 2008) was attended by some forty participants from various countries – among which Mali, Niger and Burkina Faso – and from all walks of life. The participants exchanged experiences and information on best practices and measures to transfer responsibility for, and the management of, natural forest resources in the sub-region. Field visits to a local collective (community) and to a timber market underlined the importance of community-led practices, such as mechanisms to avoid and manage conflict arising from the use of natural resources. Furthermore, experience shows that there is yet no legal or institutional recognition of the rights of local communities and of their best practices in relation to sustainable natural resource management. The respect of basic human rights was also often found to be lacking. The workshop and, in particular, the working groups identified what the future priorities should be. Action plans were developed for each country with regard to the harmonisation of official documents on the decentralisation and transfer of powers. These would involve drawing on local expertise, including local collectives in the legislative process, applying legal provisions on the transfer of responsibility for natural resource management, and respecting the rights of natural resource users. High-resolution satellite images are beyond the budgets of development projects with limited funds, and geo-referenced aerial photography for a given area is rarely available. Even in cases where it can be obtained from private remote-sensing firms, it is often not recent enough. Therefore, institutions concerned with planning at the communal, district or province level are forced to manage with outdated topographic and thematic maps. Now, a technically simple and simultaneously cost-efficient method offers an opportunity to produce up-to-date and qualitatively good aerial photographs. The technical equipment includes a small hydrogen balloon, to which a digital camera with GPS is fastened, as well as a remote-sensing software for geo-referencing the images. This guide describes the procedure step by step, in texts and illustrations. The question of how well amateurs will manage with it in practice is not easily answered. 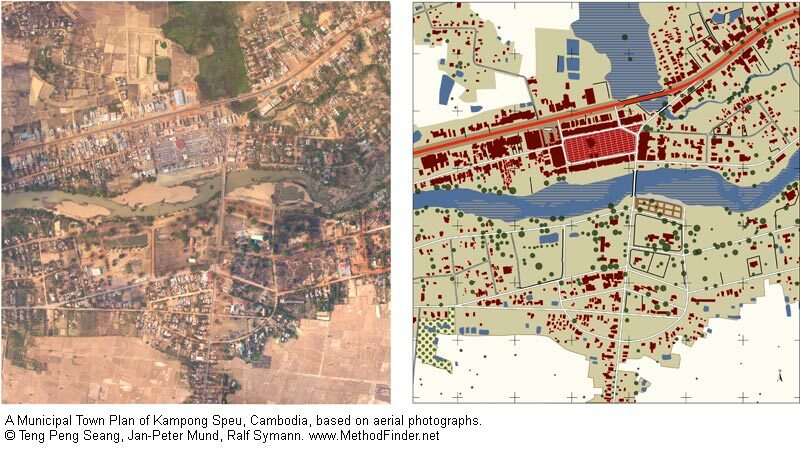 In any case the method is well illustrated based on two examples of its application in Cambodia. But the description is convincing also because the authors clearly point out the method’s limitations: for example, it is not suitable for cadastral applications with an accuracy of below one metre, or on topographically complex terrain with pronounced altitudinal differences. Generally, the method is valuable in adaptive planning and continuous monitoring, as it facilitates easy updating of spatial data. 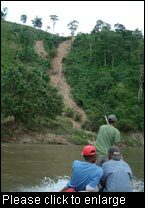 The Central American region is predisposed to extreme natural events. 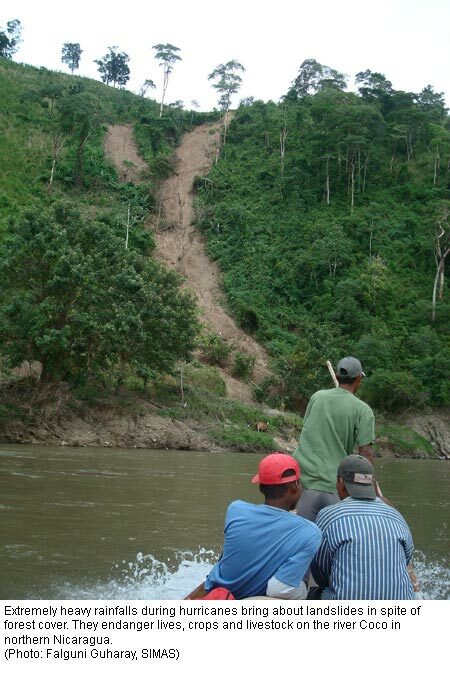 With most of the region’s inhabitants living in precarious social conditions, these extreme natural events turn into natural disasters, causing severe loss of lives and livelihoods. The magnitude of risks is alarming, and is evidenced by the fact that 6% of all Atlantic hurricanes hit the shores of Honduras and Nicaragua and that the capital of El Salvador has been destroyed 17 times by earthquakes in recent history. A book published by the University of Gerona, Spain, provides detailed information on the nature of these risks and their consequences. The authors conclude that the countries of the region have not yet developed adequate mechanisms for prevention and mitigation. On this basis, they urge governments and civil society to develop a comprehensive conceptual and practical risk prevention and mitigation framework. Recently, PRISMA, a civil society organisation in El Salvador, has voiced its opinion in favour of a strategy of adaptation to climatic changes with a view to environmental risk management. Adaptation focuses on capacity building, diversification of livelihoods, and forging resilience to meet the challenges of environmental risk management. It goes beyond the mechanisms mediated by the markets and takes a broader approach that encompasses social, environmental and territorial issues.